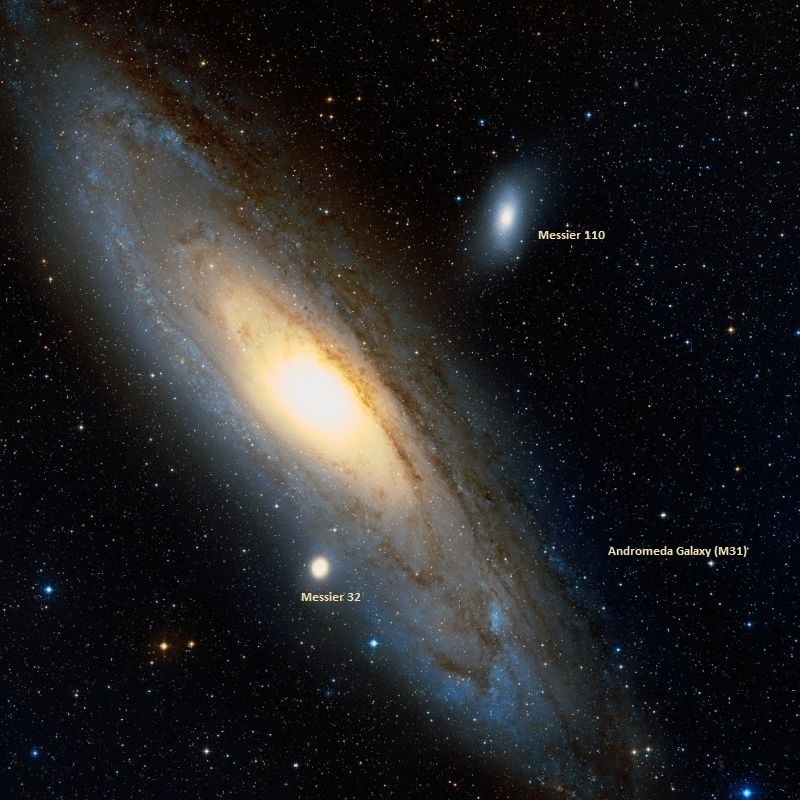 M110 is a satellite of the much larger Andromeda Galaxy (M31). It lies at a distance of 2.69 million light years from Earth and has an apparent magnitude of 8.92. 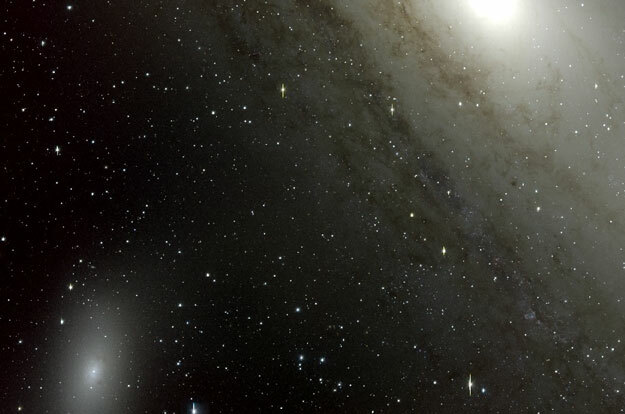 It has the designation NGC 205 in the New General Catalogue. Messier 110 occupies an area of 21.9 by 11 arc minutes of apparent sky, corresponding to an actual diameter of 17,000 light years. In spite of its size, the galaxy is difficult to observe with binoculars because it has a low surface brightness. To be seen in small telescopes, it requires exceptionally clear, dark skies. In 3-inch telescopes, M110 appears as a faint, diffuse patch of light, while 8-inch telescopes reveal a larger oval shape with a slightly brighter core. Messier 110 is easy to find as it lies next to the Andromeda Galaxy, which can be found 8 degrees northwest of Mirach, Beta Andromedae. Mirach, a red giant with a visual magnitude of 2.05, is the middle of the three bright stars of Andromeda that form a straight line from the Great Square of Pegasus in the direction of Perseus, under Cassiopeia‘s W asterism. The best time of year to observe the galaxies is during the autumn. Messier 110 shows evidence of recent star forming activity as it contains a population of young blue stars at its centre. It also has some dust, which is unusual for a galaxy of this type and likely a result of interaction with its large neighbour, M31. M110 is classified as a peculiar elliptical galaxy because of its unusual dark structures and signs of recent star formation. The galaxy does not appear to have a supermassive black hole at its centre. 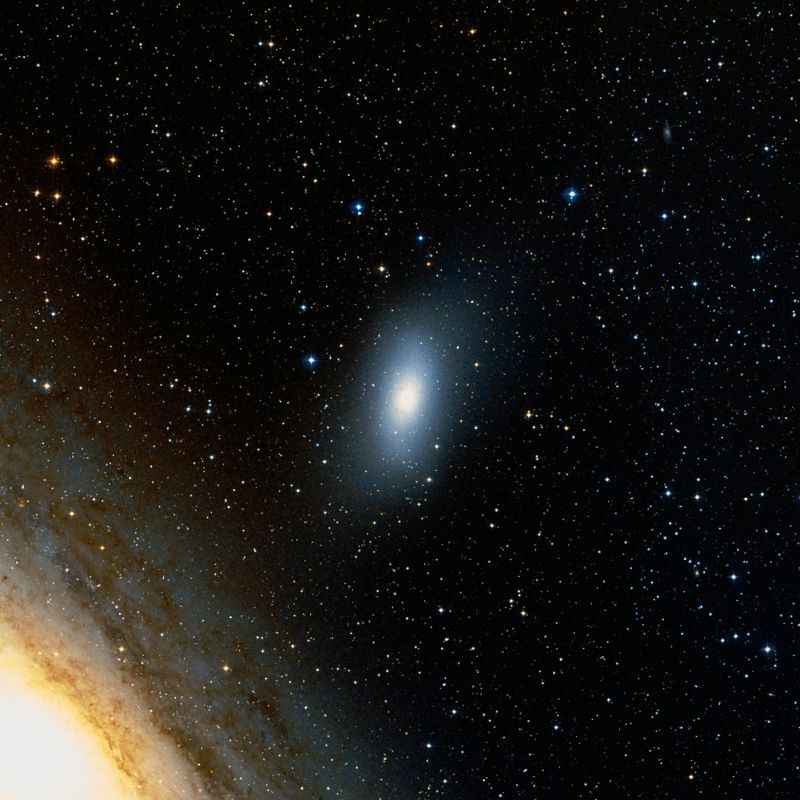 As a satellite galaxy of M31, M110 is a member of the Local Group. It is one of at least 14 dwarf galaxies orbiting Andromeda, and the second brightest of Andromeda’s satellites, after Le Gentil (M32). Messier 110 is often catalogued as a dwarf spheroidal galaxy, which makes it the only galaxy of this type listed in the Messier Catalogue. It is, however, much brighter than other galaxies of this kind and is sometimes classified simply as a spheroidal galaxy. M110 has an estimated mass of between 4 and 15 billion solar masses. Messier 110 is estimated to contain about 10 billion stars and has a population of at least eight globular clusters. The brightest of these, G73, is of 15th magnitude and can be seen in large amateur telescopes. A nova was observed in M110 in August 1999 at magnitude 18.1. It was discovered by R. Johnson and M. Modjaz at the University of California at Berkeley, as part of the Lick Observatory Supernova Search, using the 0.8-m Katzman Automatic Imaging Telescope (KAIT). On August 10, I examined, under a very good sky, the beautiful nebula of the girdle of Andromeda [M31], with my achromatic refractor, which I had made to magnify 68 times, for creating a drawing like the one of that in Orion [M42] (Mém. de l’acad. 1771, pag. 460). I saw that [nebula] which C. [Citizen] Legentil discovered on October 29, 1749 [M32]. I also saw a new, fainter one, placed north of the great [nebula], which was distant from it about 35′ in right ascension and 24′ in declination. It appeared to me amazing that this faint nebula has escaped [the discovery by] the astronomers and myself, since the discovery of the great [nebula] by Simon Marius in 1612, because when observing the great [nebula], the small is located in the same field [of view] of the telescope. I will give a drawing of that remarkable nebula in the girdle of Andromeda, with the two small which accompany it. Augt 27th . About 1/2 deg preceding & a little north of Mess 31st a nebula. There are many stars besides in the field, but these two [diagram] are the largest. A large faintish nebula of an oval form, with its major axis extending north and south. 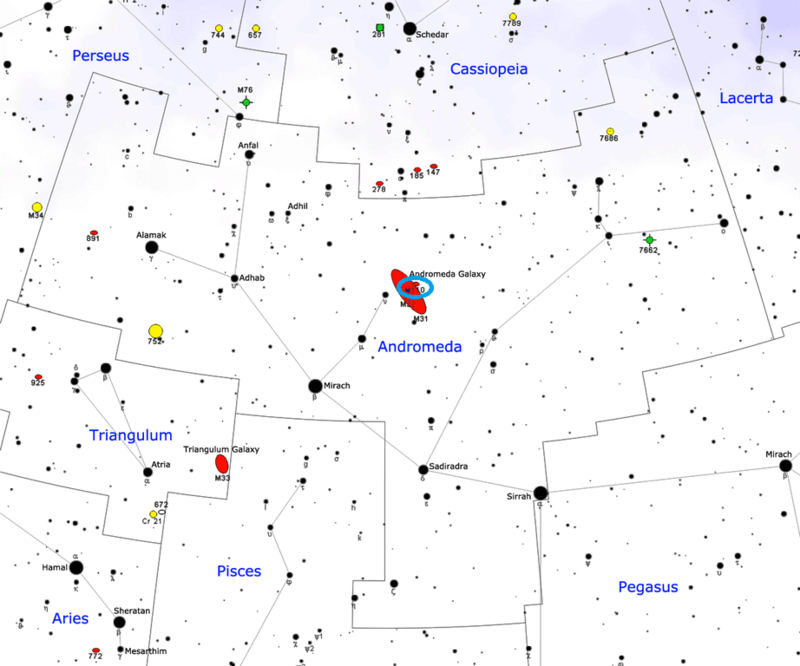 It is between the left arm and robes of Andromeda, a little to the np [north preceding, NW] of 31 Messier; and was discovered by Miss Herschel in 1783, with a Newtonian 2-foot [FL] sweeper. It lies between two sets of stars, consisting of four each, and each disposed like the figure 7, the preceding group being the smallest; besides other telescopic stars to the south, This mysterious apparition was registered by H [William Herschel] as 30′ long and 12′ broad, but only half that size by his son; and there was a faint suspicion of a nucleus. This doubt must stand over for the present, – for whatever was a matter of uncertainty in the 20-foot reflector, would have no chance of definition in my instrument. It was carefully differentiated with Beta Andromedae. The companion n.p. the nebula in Andromeda. The bright central portion is about 2′ in diameter, showing traces of rather irregular spiral structure; the nucleus is almost stellar. There are two small dark patches near the brighter central portion. Very much fainter matter forms the outer portions of the nebula in an oval about 8’x3′; no whorls can be made out in this outer portion; doubtless a spiral of Andromeda type. 2 s.n. Walter Baade resolved the galaxy into stars in 1944 and confirmed that it lies at about the same distance as the Andromeda Galaxy. Messier 110 was finally included in the Messier Catalogue in 1967 by the Welsh amateur astronomer Kenneth Glyn Jones.